After the dust settled on the fourth day of play, Maraqua emerged with a second straight victory. After beating Meridell with a WLWW, Elon managed a DWWW against his hated rival, Krawk Island. Quite the nice turn around for a team who opened up with loses to Terror Mountain and Kreludor. Known for their slow starts, Maraqua is apparently wasting no time this year making sure it is known they can play yooyuball with the best. Virtupets took on Lilo and the Roo Island crew, who was looking a little unpredictable. To that point, RI had beaten Lost Desert and Mystery Island and lost (greatly) to Haunted Woods. Distractions didn’t phase Sloth’s team. MVP contender XL Striker 3.8 brought home a WWWD. VPETS is looking powerful; they have wins now against Tyrannia, Kreludor, and the Roos. In one of the most watched games every year, Mystery Island went to take on Lost Desert. Since Altador Cup II, Lost Desert has only managed one win against a team they have traditionally placed a lot better than. Mystery Island wasn’t going to let the champs end their losing streak against them. MI handed Lost Desert their fourth straight yooyuball lose and took a WLDW back to their hut. All good things must come to an end, even if you’re Terror Mountain. After beating Shenkuu, Maraqua, and Lost Desert, Meridell flew in and shut out the blue and white. Meridell is getting pretty confusing. The knights lost to Tyrannia, beat Darigan, lost to Maraqua, and then beat Terror Mountain. A big congratulations to Moltara for picking up their first win yesterday! The newest Altador Cup team beat the hosts with a WLLW. Lost Desert has done nothing but lose in yooyuball and Brightvale is by no means an easy team to beat anymore. Lost Desert just doesn’t look up to playing lately. Though Mystery Island did just beat the defending champs, we all know Mystery Island play their hardest against LD for whatever reason. Darigan will be Darigan. Haunted Woods and Krawk Island is a weird game. I think Haunted Woods could easily tie Krawk Island in yooyuball. If HW gets that tie, I don’t think Krawk Island has the power to win any side game against Haunted Woods. Virtupets vs. TM will be a close one. This one is really just gut. Terror Mountain lost to an unpredictable Meridell and has a good amount of side game power. They just can’t give up yooyuball. Both Shenkuu and Roo Island are by no means playing spectacular yooyuball right now. Someone has to win though. I think Shenkuu could ride the high of getting a win against Brightvale while Roo Island is a little bummed about that horrific lose to Virtupets. I trust the old power rather than the new. Kreludor has looked great in yooyuball; wins against MQ and HW and draw with Virtupets. I see them as more consistent in that game than Tyrannia. After faltering against Tyrannia, expectations were not that high for Meridell going into their game against their arch-rival, Darigan Citadel. Don’t tell that to the knights though, Meridell upset the purple and black with a surprising WWLD. While this certainly raises questions about how far Meridell can go, you can’t ignore that you have to think now how good Tyrannia is? Tyrannia beat Meridell in yooyuball just the day before………. The defending champs found little love from a now Dasher-less Krawk Island squad, getting handed loses in yooyuball, make some noise, and shootout showdown. Lost Desert isn’t doing much in convincing us that the ‘curse’ isn’t hitting them at the moment. Haunted Woods shocked everyone but themselves today by nearly sweeping contender and team just coming off a brilliant game against Lost Desert, Roo Island. Is this the Haunted Woods of old? The goonies have had a history of slow starts and showing signs of life at the end of the cup, maybe they’ve just finally learned their lesson and want to join the rest of the competitors again. Virtupets Space Station edged out Kreludor narrowly with a DWWL. VPETS is clearly wasting no time brushing up their resume for a spot in the finals. Don’t be too hard on Kreludor though – they lost to Virtupets twice last year and still got the first seed going into the finals. In the other games, Brightvale and Tyrannia swept up the home team and Kiko Lake. Also, Shenkuu won, but drew all three side games with Moltara. Shenkuu has some questions to answer – teams are supposed to sweep Moltara. Mystery Island beat Faerieland while giving up draws in slushie slinger and make some noise. I just feel like Brightvale will be able to pull through. With two nice wins, confidence has to be high. They also handled Mystery Island very well and seem to be in form. If they can get the draw in yooyuball, I think they can handle the side games. Shenkuu surely has to pull through one of these days, right? Tyrannia and Virtupets both seem to be in top form, but Virtupets just beat three time finals contestant Kreludor. Virtupets has earned my faith. The Battle of the Haunted Moon is today and it looks to be the best one in years as Haunted Woods just destroyed Roo Island. Kreludor has been a top notch team for years and they did put up a fight against Virtupets despite the lose. Terror Mountain looks like a team that well….isn’t Terror Mountain. Hell Lost Desert is about to freeze over. Terror Mountain looks like they can at least draw in yooyuball and is by no means a bad side game team. Little did we know at the start of this cup that we could have Terror Mountain open with wins against Shenkuu, Maraqua, and Lost Desert. Maraqua vs. Meridell is a gut feeling. Maraqua has to turn it around eventually. We know by now that there is skill buried somewhere in that team. It needs to come out now before another late start begins to nail up the coffin. Day 2: How Do You Solve A Problem Like Shenkuu? The first day of the sixth cup wasn’t without the expected fireworks. In match-up of former champions, Lilo got the best of Lost Desert’s younger squad and pulled out a win for Roo Island in yooyuball and SOSD. Lost Desert managed wins in Make Some Noise and Slushie Slinger. We just have to wait now to see what this really means. Is Roo Island the real deal or has Lost Desert fallen from grace? Kreludor silenced many doubters when they refused to give Maraqua any wins at all yesterday, conceding only draws in MSN and SOSD. Maraqua has become somewhat notorious for their slow starts, so it wouldn’t be wise to count them out yet. Shenkuu seems to be having a recurring nightmare. Last year on the opening day they lost to the returning Kiko Lake. Now they were swept by Terror Mountain. While Terror Mountain is somewhat of a rising power and looking at throwing their hat into the ring for the race to the second tier, Shenkuu without a doubt was hoping to be able to claim their former glory and jump the likes of TM. Shenkuu didn’t even do this bad against Terror Mountain last year – they won both yooyuball games last year in the regular season. Is Shenkuu now stuck in the third tier? Is Terror Mountain climbing the ladder? Brightvale also got a nice upset for the second straight opening day. Nearly sweeping Mystery Island wasn’t nearly as shocking as beating Darigan Citadel, but it was still quite pleasing for Kayn and company. This game raises a lot of the questions the SK/TM game raised: Is this simply Mystery Island getting stuck in the lower tiers or is Brightvale on the move? In quite possibly the biggest upset of the day, Tyrannia beat Meridell in yooyuball. Tyrannia is simply supposed to take some side game points and be happy. Meridell was a popular preseason pick to make the finals and they got beaten by a team that didn’t beat any team that ranked higher than fourth tier last year. If Tyrannia pairs their past side game skills with this kind of yooyuball power, we have a new competitor on our hands. In the other four games, Haunted Woods swept Moltara while Krawk Island, Darigan, and Virtupets all won with a WLWW over Altador, Faerieland, and Kiko Lake. Old rivals clash in Meridell vs. Darigan today. Meridell should probably consider showing up after their last game against Tyrannia, but it won’t be easy against a contender for the championship. I’m going to go out on a limb and say Terror Mountain will beat Maraqua today. I think if Terror Mountain can sweep Shenkuu, Terror Mountain will be able to muster enough power to at least draw Maraqua in yooyuball. Plus, Terror Mountain is just a better side game team than the fish. Lost Desert goes from one former champ to another. I already had more faith in Krawk Island than Roo Island, so I don’t see a brighter future for LD. Virtupets and Kreludor will be close in the space battle. I trust Kreludor’s consistency to pull them out on top. This game will tell a lot put these two four tier teams perhaps. Both are without a doubt looking to make the jump back up to the third tier (or even higher) and have to be able to beat teams like one another if they’d like to make a solid case for that right. Prediction: I just don’t trust Mystery Island this year at all. They have some power, but who knows when it will actually show up? Then I look at their history and see second round loses to Tyrannia and Terror Mountain. Brightvale also started out great last year when they manhandled Darigan. Brightvale wins with a DWDW. Prediction: Darigan is a contender this year, while nobody really has their eyes on Faerieland. DC sweeps. The defending champs have to go right to work and fight off another team from the AC V finals. Lilo’s team has become a popular pick for a repeat appearence in the top four while Lost Desert has to fight for respect as the lucky team bearing the weight of the ‘curse’. Prediction: Lost Desert will feel the weakest blow the ‘curse’ has ever delivered this year. They’ll still be contending for a spot in the finals. Lost Desert will (surprisingly?) win with a DWWL. In another possible championship match-up, Maraqua will try and finally live up to their hype while Kreludor will look to make the finals for a third straight year. Prediction: It’ll be a close one. In the past, Maraqua has traditionally been a yooyuball power while faltering in the side-games. Kreludor is scary consistent in all four games for the most part. I think Maraqua will outlast Kreludor and pick up the coveted yooyuball win and trump Kreludor with a WLLD. Meridell barely missed the finals and tumbled down the rankings during the playoffs last year while Tyrannia was sent packing back into the third tier. Meridell of course is expected to win yooyuball, but needs every point from the side-game champions if they want to finally be able to play for gold. It’s scary to think that Terror Mountain finished higher than Shenkuu last year, but here we are. Terror Mountain is a fringe team now, we know they’re better than the likes of the fourth tier, but not quite up to par with the pack that’s trying to make the finals. Most are forgiving Shenkuu of their absolutely dismal showing last year and expect something a lot a better this time around. Anything less though, and Shenkuu may join the likes of teams like Haunted Woods who fell from grace and are now stuck in the third tier. Prediction: I do think Shenkuu will do better this year, but Terror Mountain will pick up some steam too. Shenkuu wins with a WDDL. Prediction: I predicted a Krawk Island appearance in the championship game and Altador in the bottom two. Krawk Island wins with a sweep. Prediction: Haunted Woods showed signs of life last year while Moltara picked up no wins in yooyuball in the regular season. Haunted Woods sweeps. Virtupets is now the sweetheart of the cup, trying to go from dead last to fighting in the finals. Kiko Lake showed some nice victories against Shenkuu and Maraqua last year, but was in the bottom tier at the end of the day. Prediction: Virtupets will get better this year. They’ll win against KL with a WDWW. 1. Darigan Citadel: I can find no fault in this team. They’re huge, they’re powerful, they know how to play, and they’re in it to win it. Yooyuball is their forte, beating everyone at least once last year with the exception of slippery old Maraqua. Not only can they play yooyuball though, they can beat you in the side games at the same time having a more than adequate grip in Make Some Noise and Slushie Slinger. Look for us to have our first repeat this year…. 2. Krawk Island: Man, if this happens. I don’t think I’ll be able to take my eyes off of it. Could anything be more perfect than Darigan/Krawk Island championship game? Regardless, Krawk Island is back. Just one year after Dasher brought home gold, Krawk Island barely missed making the finals yet again. 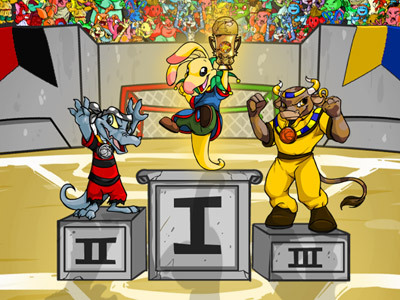 As reigning champions, Krawk Island beat Darigan, future champions Lost Desert, Roo Island, and tied Kreludor in the second round. Now out of the watchful eyes of the curse, a new, younger Krawk Island will look like the KI of old. 4. Virtupets: I know I told myself that Kreludor would make the finals, but I think Virtupets has a lot more to gain while Kreludor has a lot more to lose. Virtupets hasn’t peaked yet and will keep going up. This is kinda crazy and mostly just a gut feeling, but I’m calling a Virtupets invasion of the finals. 5. Shenkuu: Returning from the cellar, Shenkuu will have something to play for. They won’t be seeded highly going into the finals, but Shenkuu will be playing for respect after a horrible year in AC V.
6. Kreludor: It’ll be close, but they might barely miss the finals. I think Kreludor may have peaked? They’ll have the top seed in the second tier for sure. 7. Lost Desert: The returning champs will be a power this year, the rankings might not show it though. 9. Meridell: I just don’t have much faith in Meridell either. I don’t like their side games and they don’t seem consistent enough to me. Someone has to miss out on the top 8. 10. Terror Mountain: TM will gain some power this year. Look for them to break into the top eight in AC VII. 11. Brightvale: Kind of like Terror Mountain, but I have more faith in TM evolving into something that might break the wall that is around the top eight. 12. Haunted Woods: The goons will never be consistent. They’re a good team, but they just need to get their act together. 13. Tyrannia: More of the same from Tyrannia. 14. Mystery Island: I have no reason at all to have any faith in this team. 15. Kiko Lake: Better than AL, FL, and MT. 16. Moltara: Surely they have to get better, right? 17. Faerieland: I think they can beat Altador when it counts. Before we think I’m horribly crazy, I was right about the top three last year. Cut me some slack.